We assume that most of you reading along with our adventures do not live in an RV and that many of you have not spent time in them. So we wanted to explain some of the basics of our new life. One of the most apparent differences from our stationary life is where we spend our nights. On the one hand, no matter where we go, we are home and are sleeping in our bed. On the other hand, we never know where we’ll be parked in a couple of days (or even that night!) Here are a few of the places we’ve stayed over the last 14 months. Prevalent and convenient, Walmart provides a dual offering of both a place to spend the night and a chance to pick up whatever we might need (and bring it right back to our front door). Occasionally they won’t allow (or the city ordinances forbid) overnighting in their parking lot but you can quickly tell if it’s allowed when pulling in, based on the other RV’s already gathered. The lights are constant, as are the traffic sounds – Walmarts seem to be generally located on one of the busiest roads in the area. As a place to stop while en route, they’re hard to beat, though. Apparently Sam’s has a similar appreciation of RVers, but we have yet to stay at one. They’re on our radar as options when needed, however. Another good place to stay en route, these are conveniently located near the interstate. They often provide numerous services including showers, laundry, fast food, and more (other than bathrooms, coffee, and gas we haven’t yet utilized any others). As you might expect, they’re pretty well lit and earplugs are handy as you’ll be listening to big rigs moving around all night long. We’ve only stayed at a few of these so far – so many of the smaller parking areas don’t allow for over-night stays and some states have limits on how long you can park (ranging from 15 minutes to 12 hours). They can be far enough back from the road to mute the traffic noise but are often close and thus have a constant background noise. They do make great places to stop and stretch or prepare a meal (just as when traveling in a car) and we generally try to find one as we enter a new state so that we can grab the official state map. The outdoor retailer has parking areas for over-sized vehicles and often provides stations to empty and fill tanks. We stayed at one while slowly making our way to the Bad Lands (pausing due to Sturgis). It was far enough back from the interstate to be quiet, but we were staying in a big parking lot, so it’s not the kind of place you’d want to spend a lot of time at. Very convenient while traveling, though. Apparently, CB has an overnighters-are-welcome policy. We have yet to stay at one (they are few and far between up here in the north west) but they are on our to-try list. A chance to peruse the knick-knacks in the store and grab a hot breakfast sounds good to us. Plus, they close at night, so we’re hoping they would provide security with the lights in the parking lot but a good rest with little background traffic noise. We’ve spent a lot of time staying out in the wilds in National Forests, deserts, and wilderness areas. Free camping with beautiful views – it’s a hard combination to beat. This is commonly called “boondocking” or “wild camping”, though the forest service calls it “Dispersed Camping”. With no utility hook-ups, we have to be self-containing and rely on our storage tanks, generator, and batteries for our needs. So far we’ve been able to stretch our 37 gallons of fresh water to 10 days. 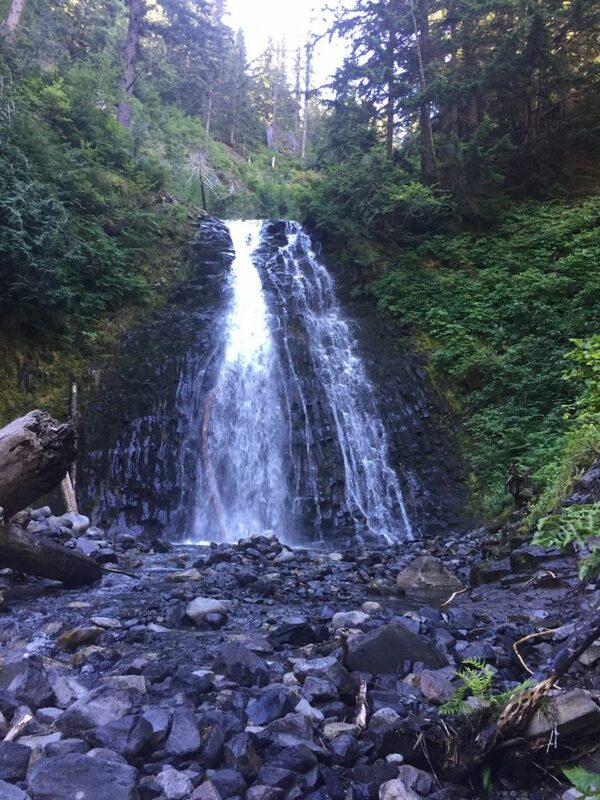 Especially here in the west, there are a lot of national forests and a lot of places we can stay, so we have greatly enjoyed exploring a lot of wilderness from within. Oh yes, there are also plenty of campgrounds scattered around the country thus far. We are members of Passport America, a discount organization that gets us half off for at least a couple of nights at grounds that are members – so we use their guidebook regularly. Sites have ranged from new to old, shiny to worn-out, working to questionable. Not everywhere has a Passport America campground, so we have a collection of apps and directories that we use to find sites. Many cities and counties seem to have a small campground for travelers, as do National Parks and Forests. Campgrounds generally have the advantage of electricity and access to water and dump tanks for our waste. Who knows where we’ll stay next! We have spent time parked in family’s driveways or the street nearby and left the RV in a church parking lot while staying in a delightful cottage on the lake. So far we have felt safe in our home, no matter where we’ve been parked. Occasionally we use our ear plugs to help provide a better night’s sleep but those nights are more than made up for when we get to wake up and appreciate a grand view of nature’s wonder during our morning’s beverages. Exploring the world doesn’t mean we’re always staying in grand locations. It does mean that we’re happy in our home, though, wherever it might be parked at. At this point we have been traveling for 14 months, living in our RV full-time while on the road. Some of you have asked how the RV feels and if it’s becoming cramped. Here are a few of our thoughts on the subject – if you’re in the market for an RV of your own, perhaps they may be of some help. We have a 2002 29′ Class-C motorhome that we remodeled. It definitely feels like home and we love it more the longer we live here. We can see ourselves living here for many years, even if we decide to stop traveling. It’s more than big enough to be comfortable – we feel neither cramped nor is anything too far away if we have to go and get something we forgot. Physically, the length from bumper to bumper is 29’10” and is externally 8′ wide. So, at most, we have under 240 sq ft of room. Though we will need a workshop or storage shed for storage once we settle down (there are tools and such in storage now), we don’t currently want anything bigger. If we were to build a house of the same size and add a loft above it this would feel absolutely luxurious as we’d have a whole extra room to use for something. If anything, for traveling, we need something smaller. We have stayed in a variety of locations – from WalMart parking lots to gravel campgrounds to spots in the woods miles off of a gravel road. Especially with the trailer added in, we are just under the common length limit for a number of campgrounds. While that hasn’t affected us it would be nice to be smaller and a bit more nimble, mostly for our times out in the wilderness. Our entire bedroom sticks out past the rear axle, so we have to be extra careful crossing pot-holes and dips, otherwise we can scrape with the rear bumper and trailer-hitch. We have had to pass up on some splendid-looking sites because we couldn’t cross the drainage ditch at the entrance. A truck-bed camper in a 4-wheel drive truck or a 4×4 conversion van would suit perfectly for access to the back-country sites that we are drawn to. It would be small for long-term living (or so we imagine) but perfect for our time spent traveling. A shorter version of what we have now would also allow us to be a bit more flexible, though we’d have to jettison some more stuff to shrink down somewhere smaller. Perhaps having a conversion space – a fold-down (murphy) bed of some sort – would be a good compromise. Along the way we have seen quite a few different RV’s of all shapes and sizes. I am intrigued by all of them and interested in trying everything out, at least for a bit. The teardrop trailers look like they’d be perfect for vacationing – small, light, cheap and nimble. The Class-B’s look rather agile and relatively fuel efficient, I’m especially drawn to the RoadTreks. We both think that the classic Airstreams look like a lot of fun and could have very interesting interiors (though I wouldn’t want to polish the outside of one). Always a fan of DIY projects, I love the idea of building a motorhome out of a work van of some sort. There are so many different variables to consider, it can be hard to choose. We didn’t have, or want to purchase, a vehicle to pull a trailer, so those were out. The Class A’s (look like greyhound busses) were bigger than we wanted, narrowing the field further. Class B’s (that look like a big van) often didn’t have a dry shower (separate shower and toilet space) or permanent sleeping area and we didn’t want to convert our eating booth into a bed and back every day or have a wet toilet seat in our long-term home. Our decision was relatively easy, as we lucked into a good platform that was readily available at a price we liked. Would we make the same decision today? Absolutely. While a smaller RV of some sort would open camping options and we would be perfectly comfortable in one, we weren’t just buying for a road trip, we were purchasing a long-term house. We are comfortable inside, with enough space for our things and projects and to individually spread out and also comfortable driving (as long as we aren’t downtown somewhere or on a curvy, slippery road up in the mountain top). A larger RV would give us even more space but we don’t feel that we need it – though we might if we were stationary for longer periods of time. Eventually, I expect that we’ll try out something different – maybe we’ll have a travel trailer of some sort for vacationing or build a conversion van so that we can spend more time in cities. Until then, we’re happy with our RV, love our home, and really can’t imagine anything better. Ashley and I have been very happy on our trip thus far. There have been few bad days. We really are blessed, and we know it. If you step back and look at it, we are living a pretty simple life. We get up and have a leisurely morning, savoring our coffee and tea as we wake up. Then a home-made breakfast, eaten together. We write or read or craft for a bit, then either head out for a hike, bicycle ride, enjoy some yoga, or do chores/run errands. Lunch has recently been a picnic out on the trail (granola, peanuts and raisins, some peanut butter). Or picnics on motorcycle trips, or maybe a salad or left-overs at home. Frequently eaten outside, always together. In the afternoon we finish our hike, do some chores, read some more, or do more crafts. This is often when we head into town to run errands. Soon it is time to prepare supper. Once it is finished we eat, together. After cleaning up we relax, get in some more reading, and watch as the sky changes from day to night. We top off the evening with some herbal tea before bed. We go to bed tired after a good, full day. It’s a simple life, one that makes us happy. Set predominately in nature, with good company, real food, and favorite activities. Unrushed and without schedules set by others. 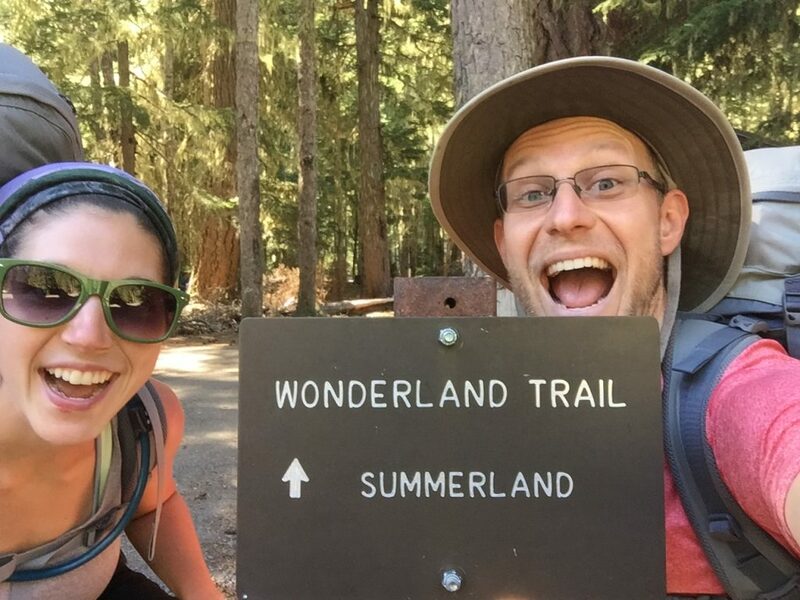 Our last post explained the logistics and preparation of our Wonderland journey, so now on to the good stuff, the actual trip and daily notes we took along the way. Ranger Jonathan at the White River Backcountry Information Center got us a permit on the 1st try at 2pm. Matthew motorcycled to Longmire to drop off our food cache and got there just before closing time at 4:59 pm. We overnighted at White River Campground which was super convienient because we start the trail tomorrow at the White River trailhead a few hundred feet away. It was a short day and we arrived in camp at about 12:30 pm. It was a good way to start out, an uphill climb most of the day so a good way to break in and get our legs used to climbing. We were assigned to the group site and had a pit toilet and bear pole all to ourselves. We heard from another group that tonight was accidentally overbooked (apparently the permit admission system had been glitchy) so we might end up having to share sites. We took a nap and woke up to some neighbors in our camp site, which was fine with us, there was plenty of space and we were just happy to be on the trail. 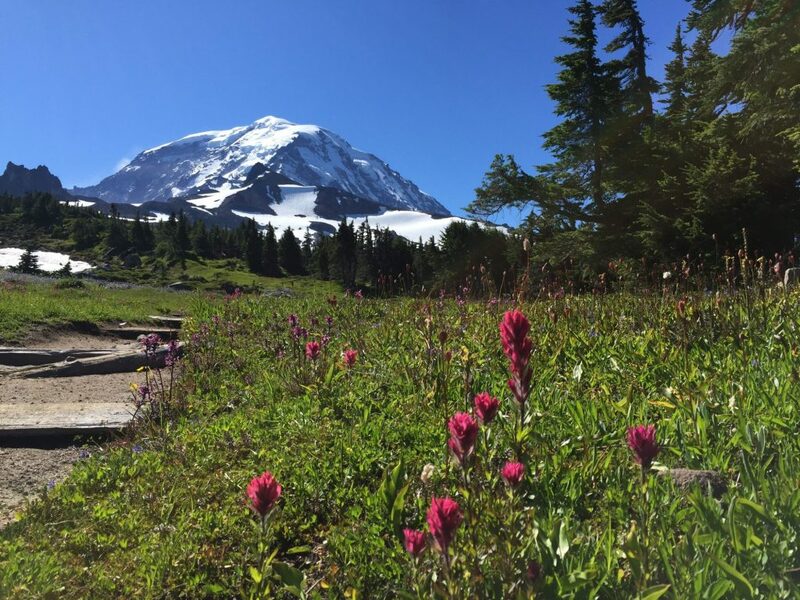 Clear skies today gave us some views of Rainier from the Sunset area of the Park. Passed Mystic Lake today around our mid-way point and soaked our feet in the cool water for a while. Passed trail crews working along the way. Also picked and snacked on cloudberries growing alongside the trail, what a delicious treat! We are taking the Spray Park trail as an alternative to the official Wonderland trail for this section as it is supposed to be more scenic. Cataract Valley camp was overbooked and pretty crowded (there were like 3 groups that had to share the group site) but we arrived early enough that we had a spot all to ourselves. It was very damp in the evening, I think we hiked into and camped right in the middle of a fog layer. It was a long but gradual uphill hike to Golden Lakes where we stopped for water and lunch. 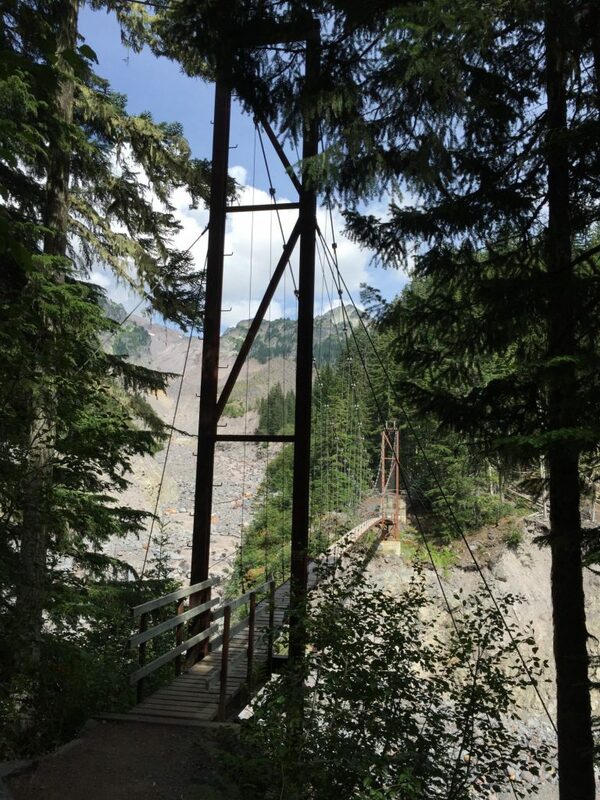 Got to camp around 2 pm and headed 0.1 miles down the trail to the bridge overlook on the North Puyallup River. What an amazing view! Stunning ridges and cascading waterfalls. We ate dinner on the rocks, admiring the view, and chatted with a group of 4 from Seattle we had been leap-frogging with the last few days. We also found more cloudberries and wild mountain strawberries to snack on! Our favorite camp area thus far! Killer day but some of the most outstanding views! After our morning climb to Klapatche Park (where we snacked on berries the whole way up) we took a pit stop and much needed swim at St. Andrews Lake. We didn’t bring swim suits, but trail traffic was pretty slow so we took turns being the lookout while the other went for a quick skinny-dip. We felt like whole new, fresh people afterward. The amount of sweat that has poured out of our bodies each day is baffling. It was a roller coaster of ups and downs today, and I was out of energy by the end of the day, but it was so worth it. 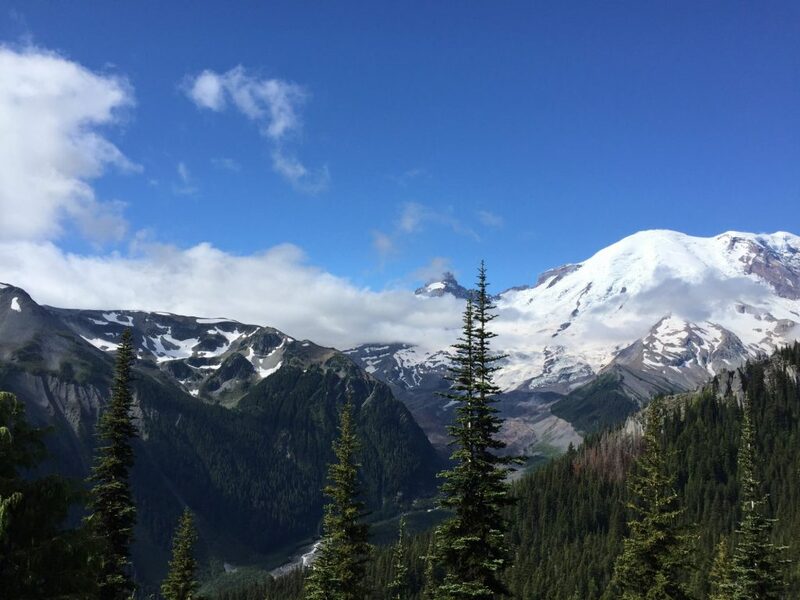 Our favorite view was at the top of Emerald Ridge, where we finally got a sense of just how spectacularly massive and imposing Mt Rainier is. We could also really see the stunning blue tinge of color in the crevasses of the glaciers. Indian Henry’s was also really beautiful with meadows full of flowers – only wish we had admired it a bit longer, but it was nearing the end of our day and I was itching to be done. We arrived to camp pretty late for us, around 6 pm, and ate our much earned Chili Mac while swatting away at the mosquitoes. Devils Dream was a very buggy area. Now this day almost broke us 🙂 Just kidding. 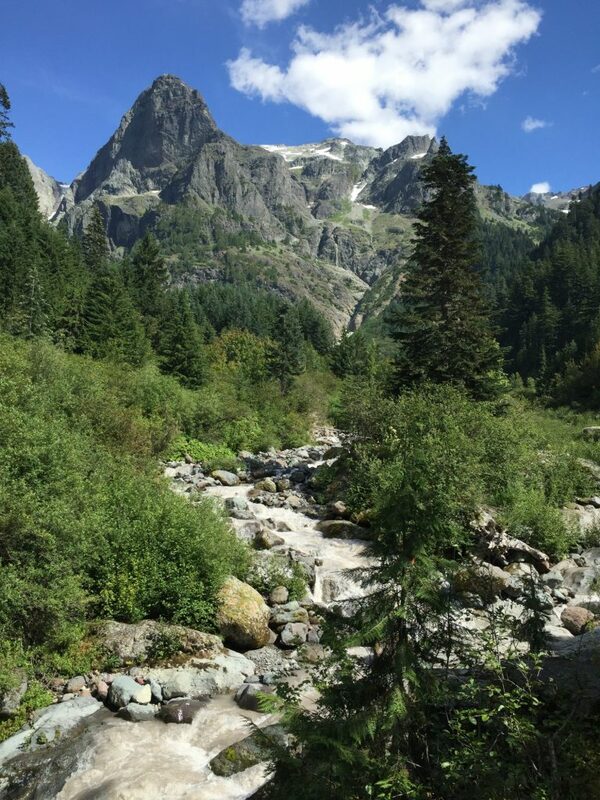 To make our permit work, we had to do a short 2 mile day to Pyramid Creek. This actually worked out really well since we had a strenuous day yesterday, thus a short day proved to be a welcome break. 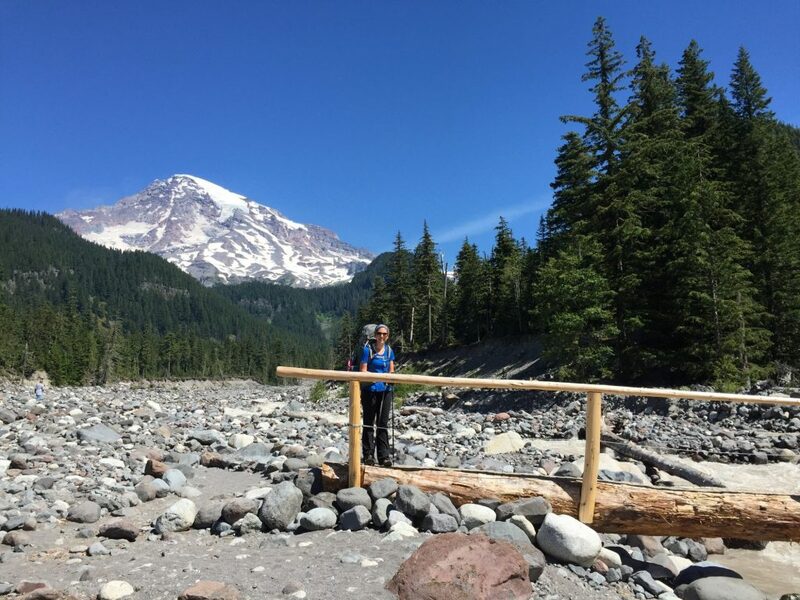 It gave us a chance to rest and just enjoy our time admiring the view of Rainier from Pyramid Creek. Considering it was a whopping 2 mile day downhill, it would have been easy to do the Wonderland in 9 days instead of 10, but because of campsite availability, this is what we ended up with. We arrived in camp at 9:30 am (and that was after a leisurely breakfast at Devils Dream), hung our stinky clothes to air out (they needed it badly after 6 days of sweat accumulation), took another ziplock bath, ate lunch on the creek bank enjoying the view of Rainier, ate some wild black raspberries for dessert, took a nap, and played a few rounds of cards. It was a great, relaxing day! 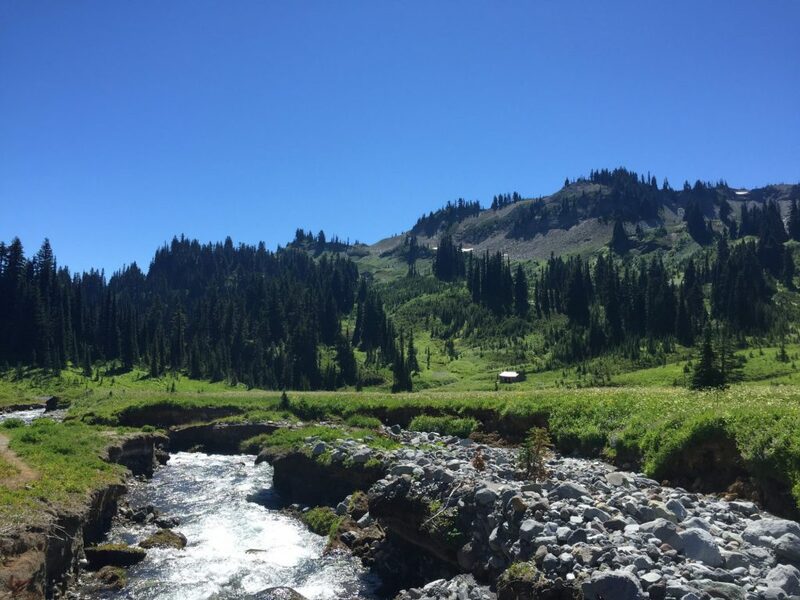 Olallie Creek Camp is actually located 1.3 miles off the Wonderland Trail on the Cowlitz Divide Trail, but all the campsites on the Wonderland near this area were filled up when we got our permit, so this was a great alternative. The scenery today was not that spectacular, mostly just hiking along river beds and forests, but the trail-side berries were abundant and we finally felt confident in our identification of huckleberries after talking to other hikers yesterday, so we started enjoying them too! 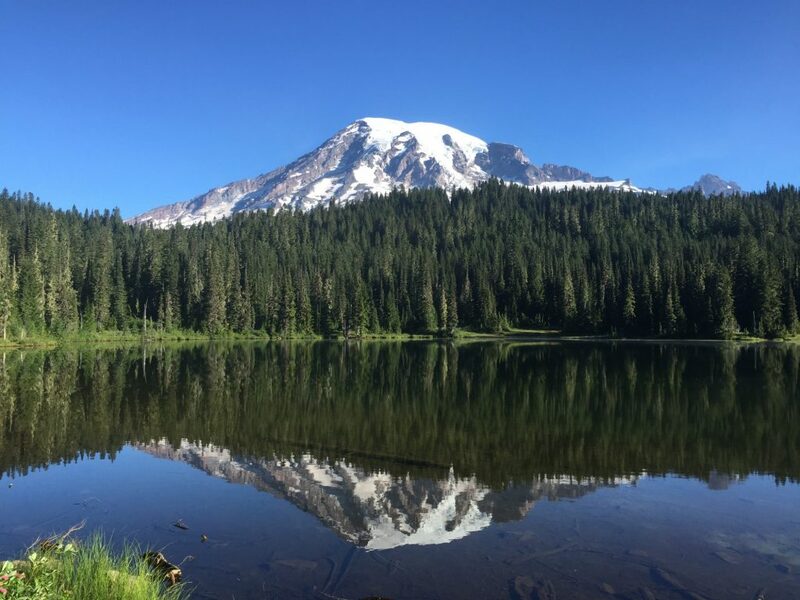 We hiked past Reflection Lakes in the early morning and got some great pictures of Rainier mirrored in the still water. Olallie Creek camp was fabulous. It was literally right on the creek with a deep swimming hole just below our camp site. There were no other campers in the campground that night and we were surrounded by huckleberry bushes! The surrounding huckleberries made a great addition to our morning oatmeal. We saw a black bear in a tree across the creek as we left camp in the early morning. He was enjoying some huckleberries too! 🙂 It was a day of continual climbing, but the views were so spectacular we hardly noticed the climb (well, that might not be entirely true, but this is my rosey retrospect). It was definitely some of the best scenery of the entire route. 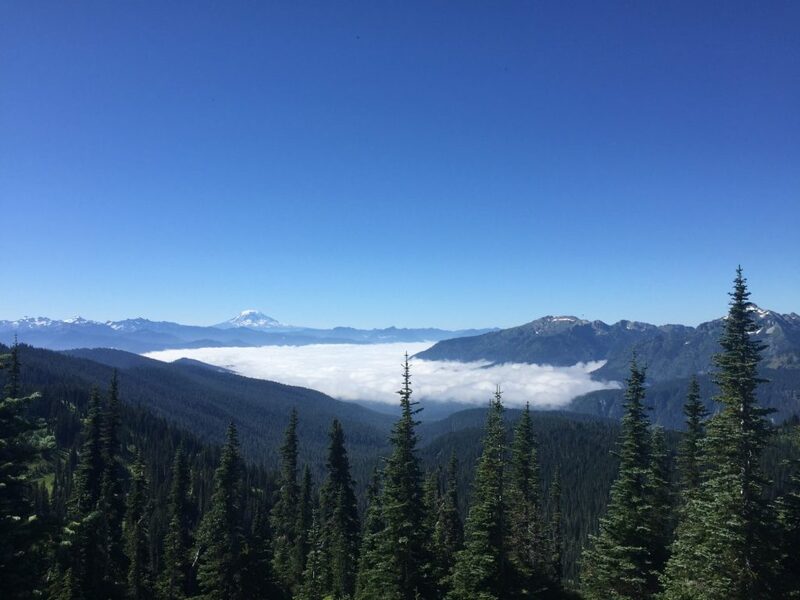 Working our way along a ridge for most of the day, we saw incredible views of Mt Adams and Mt Hood in the distance. We took a break at Indian Bar, which is the camp located in a huge bowl shaped basin with the Ohanapecosh River running through it. Some of the most stunning wildflower displays of the trip were here as well. I used the pit toilet at Indian Bar which had the best view of any backcountry pit toilet yet! 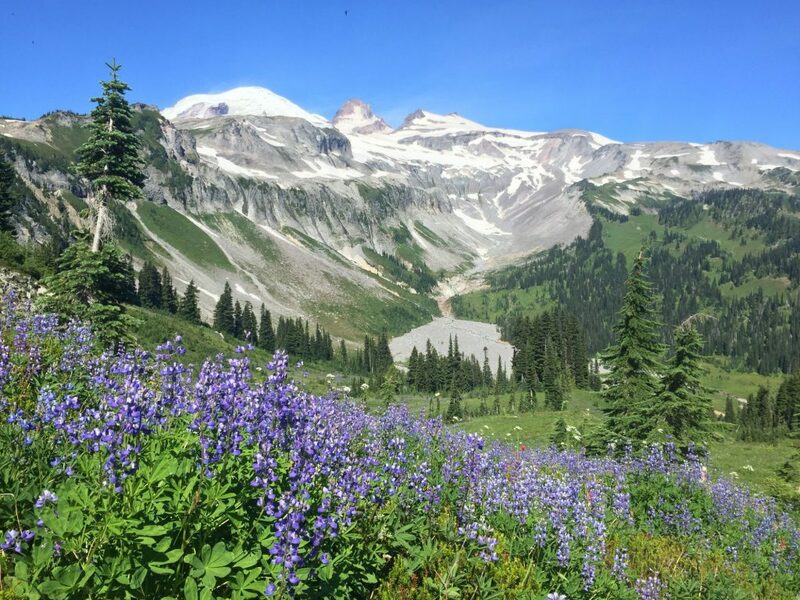 It had views of the wildflower meadows, the cascades tumbling down the cliffs at the head of the basin, and the crown of Mount Rainier above it all. A “throne” indeed! 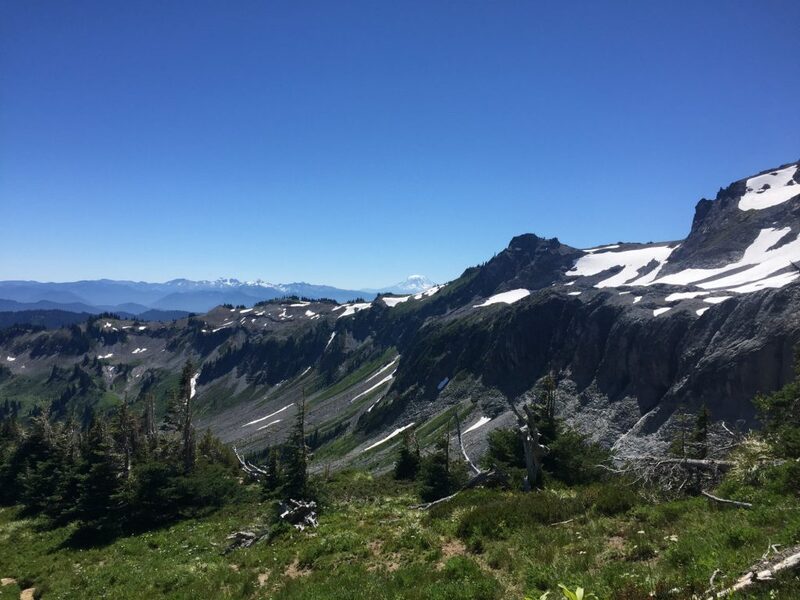 From Indian Bar and working toward Summerland we rested atop the Panhandle Gap (the highest point on the trail at 6,901′). 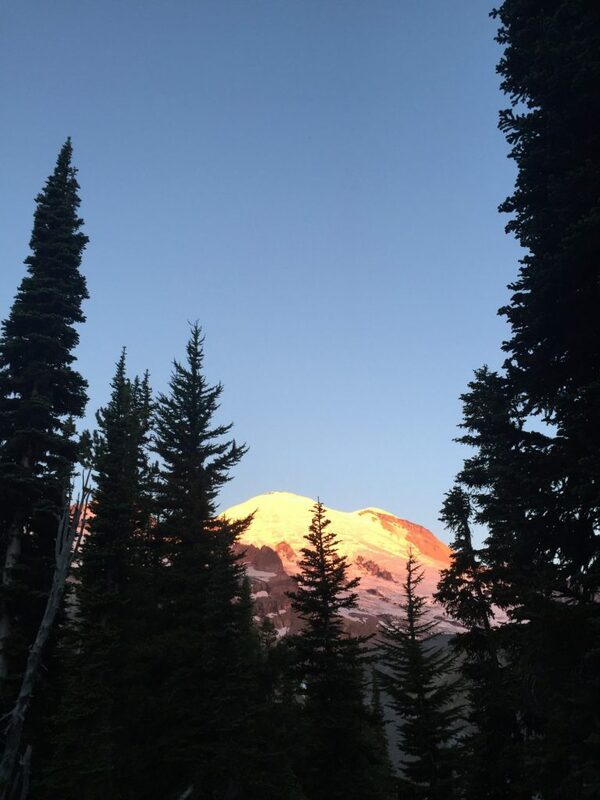 Summerland camp was stunning and we had views of Rainier out our tent as well as a marmot and ptarmegan for neighbors. A spectacular place to spend our last night and an amazing finale to the trip! And incredibly easy day of working our way down. We were back to the RV by 10:30 am. The trail was amazing and definitely full of wonders! Drove down to Longmire to pick up our empty cache bucket before heading out of the park. 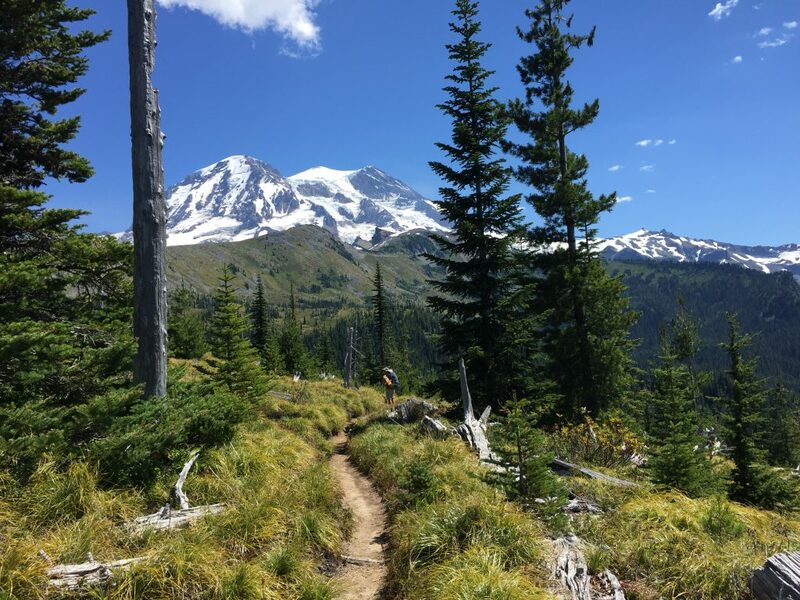 I was immediately intrigued by the idea of backpacking the Wonderland Trail when I started researching trails to hike in Mount Rainier National Park back in April. It sounded like an amazing undertaking, but I figured, what with having to get an advanced permit and all, that this would be another trail added to our future to-do list (which only seems to grow after visiting places). 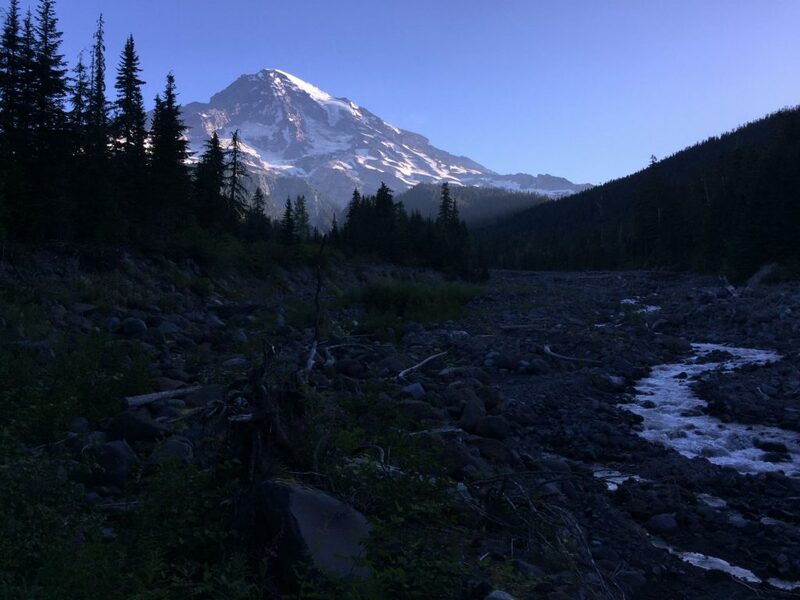 Then, after spending 4 captivating days in Mount Rainier at the beginning of July, my desire only grew and I began looking in to the venture further. 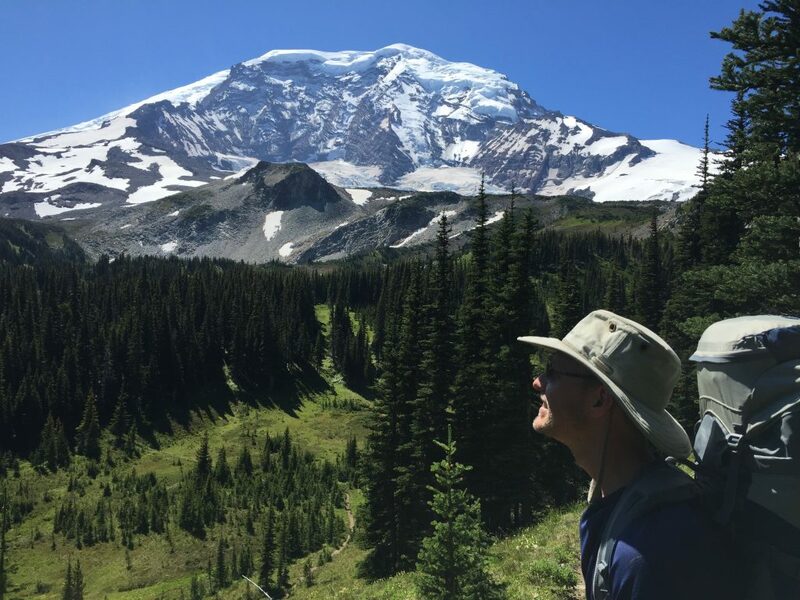 There is just something about Mt Rainier and its massive, majestic beauty, that pulls you in and calls to your spirit of adventure. 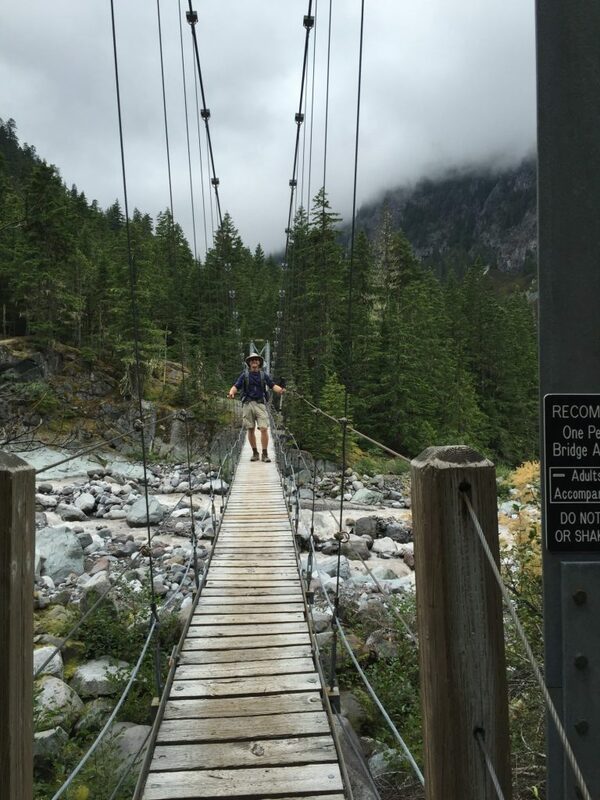 For those of you who don’t know anything about the Wonderland Trail, here’s a little background. 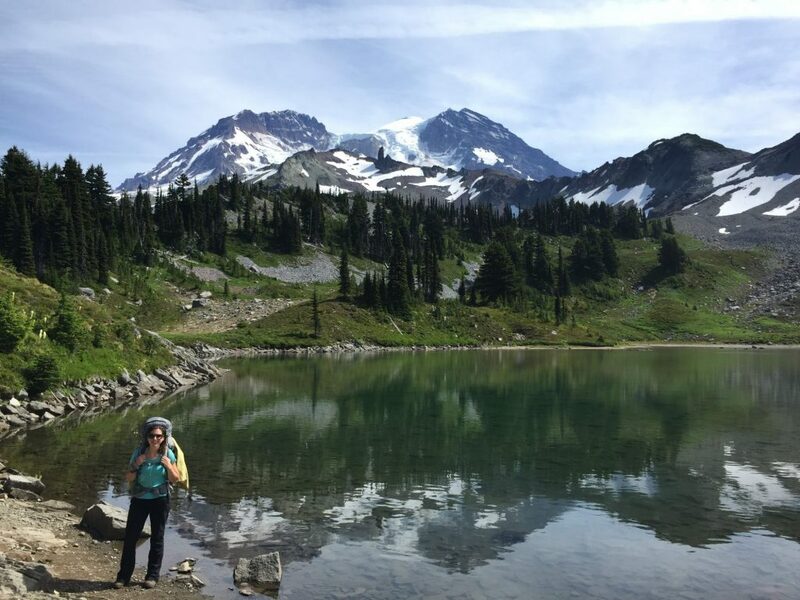 The Wonderland is a giant 93 mile loop trail that goes all the way around Mt Rainier. 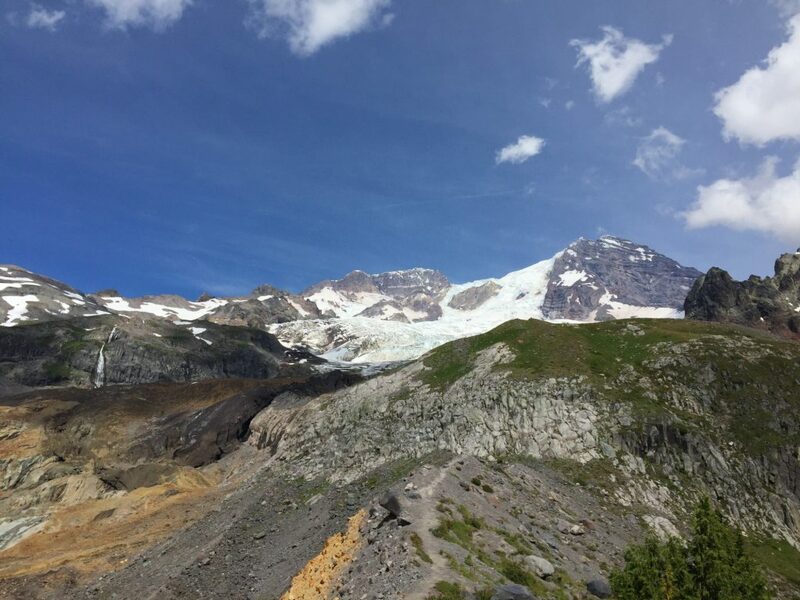 The many glaciers coming off the mountain have carved deep valleys and ridges, making the trail notorious for its tremendous elevation gains and losses. 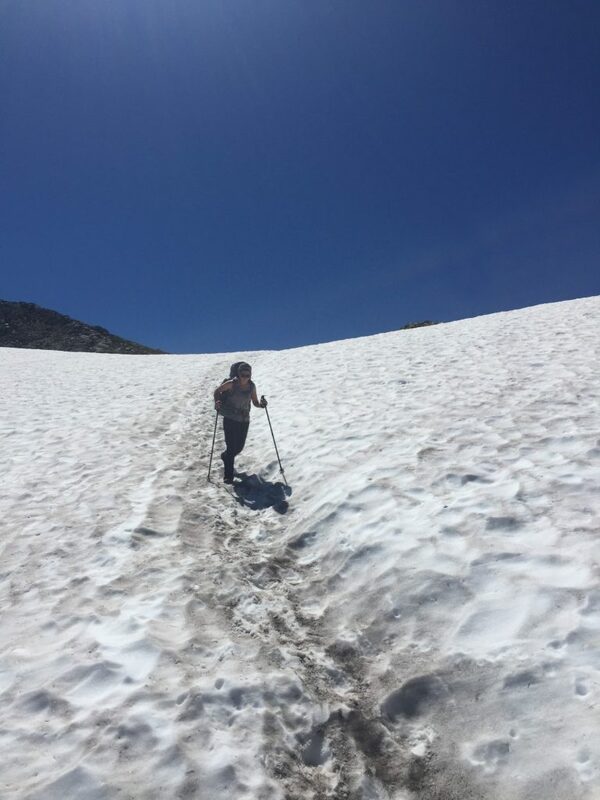 Due to these huge elevation changes, by the end of the journey you have cumulatively climbed 22,786 feet (and descended another 22,786′) and hiked the equivalent of 126 flat miles. 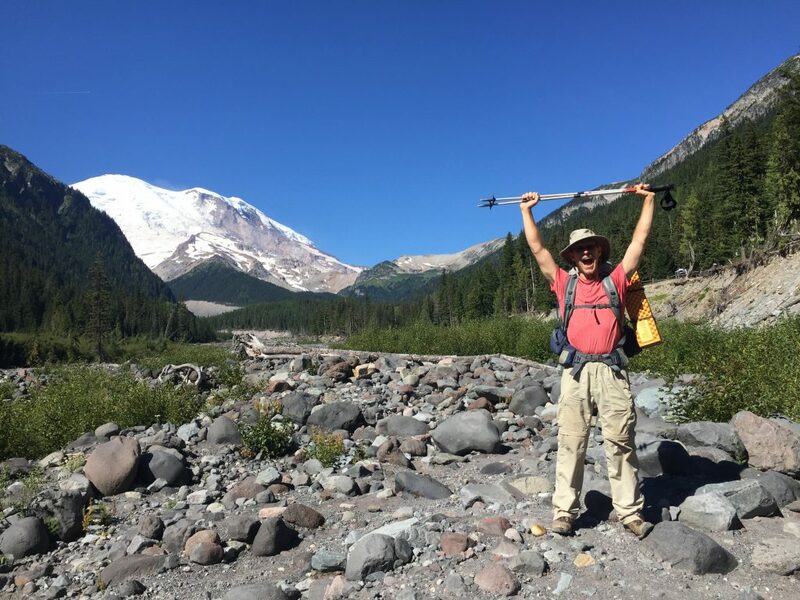 That means that Wonderland Trail hikers do enough climbing to have climbed Mt Rainier 2-1/2 times (which stands at 14,410′ at it’s summit and climbers start at 5,359′). Now that’s a lot of climbing…Challenge accepted! 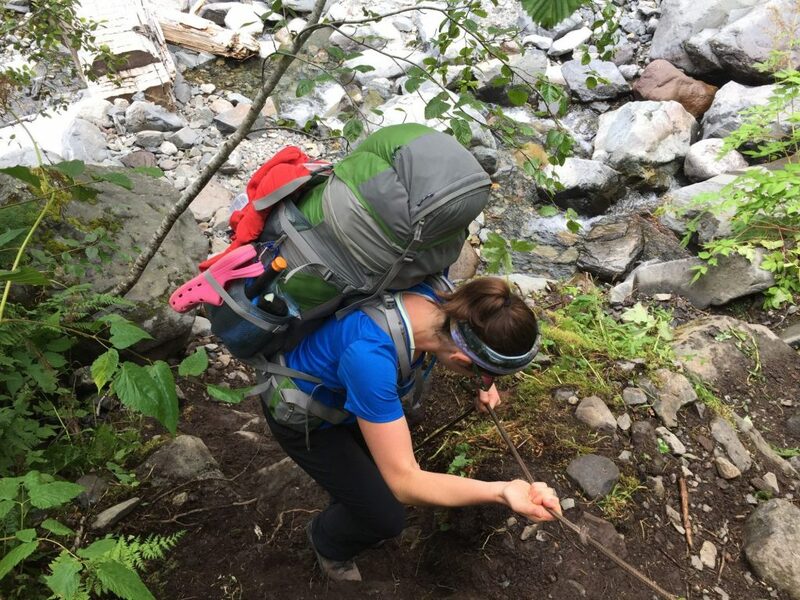 Normally, you have to apply for an advanced reservation to hike the Wonderland Trail, and these are getting increasingly harder to come by as the number of people who want to hike the trail grows each year. This year, however, the reservation system crashed and all permits are being given on a first-come-first-serve basis. This was perfect for us. We had the time and the flexibility to try and make it work! I had spent a good amount of time researching and planning, and most of my sources recommended doing the trip anywhere in 8-14 days, though 8 is pretty tough with long days and 14 is super leisurely with rest days included. We decided on a 10 day itinerary and it worked out great. One of the the really cool things about the Wonderland Trail is that you can cache food at certain locations around the trail. With a 10 day itinerary, we decided to take advantage of only one cache location, and that was at Longmire. We arrived at Longmire during our 7th day on the trail, so we carried 6-1/2 days of food with us for the first leg, and then picked up our cache full of the remaining 3-1/2 days worth of food supplies. You can take advantage of more cache locations (Mowich Lake, White River, Sunset) and carry less food which means less pack weight, but it would have taken us forever to drive around to the multiple locations to drop off the caches, so we decided carrying more in our packs was a better option for us. If you’re looking for complete solitude and seclusion, this isn’t the trail for you. It’s relatively busy and you’re not likely to have a campground to yourself. 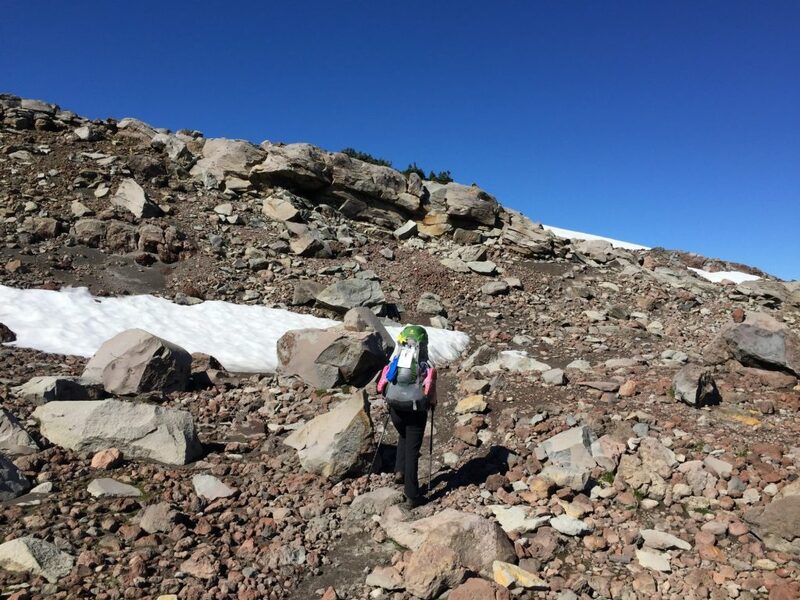 While caching food is readily available about the trail, this does mean you’ll be sharing the path with many day-hikers during these sections in addition to other backpackers. 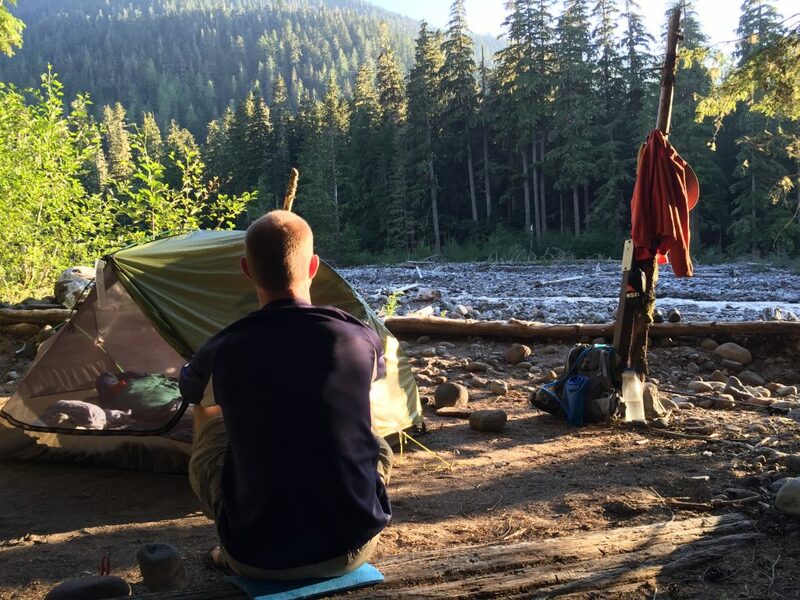 However, since you have to stay in designated backcountry campsites, you don’t have to worry about trying to find somewhere to pitch your tent or hang your hammock each night. 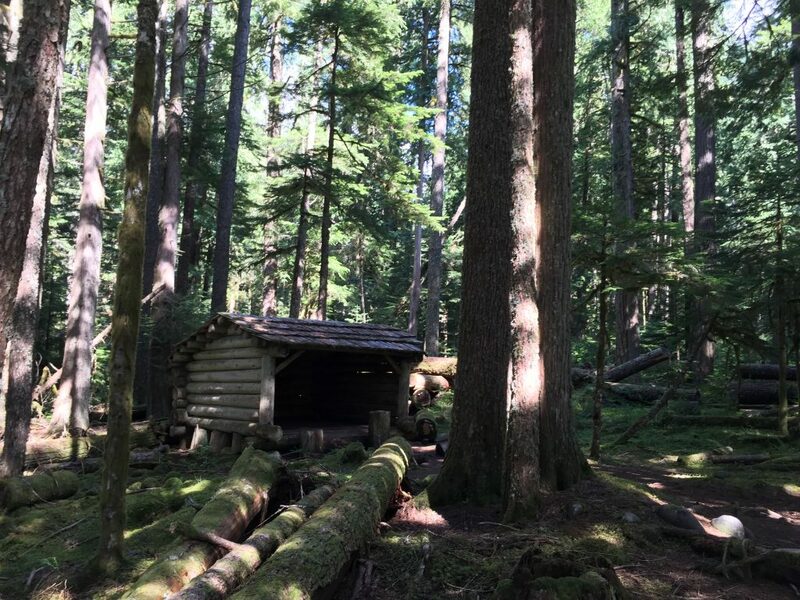 Additionally, each campground provides the convenience of a pit or composting toilet and a bear pole for nightly food storage. Quite nice for planning purposes! Planning and preparation completed, check out the details of the hike itself here…. We are loving our RV adventure, traveling around and exploring the United States. Along the way we have discovered a few things about the mobile lifestyle that we didn’t expect. Here’s one of them, a perk that we hadn’t anticipated. There’s something wonderful about grocery shopping from your RV. Drive to store – We just park our home there in the parking lot, it’s not a separate trip but a stop on our way. Drive home – The shopping cart is wheeled right to our front door. Transfer groceries from car to house – This was done when unloading the shopping cart.. It seems like such a simple thing but the ability to go directly from cart to cabinet is an unanticipated benefit that we are thoroughly enjoying. Perhaps we all need time to be free, time to be alone in nature, supported and encouraged to discover our own wild selves, to reconnect with who we are and what we want from life. 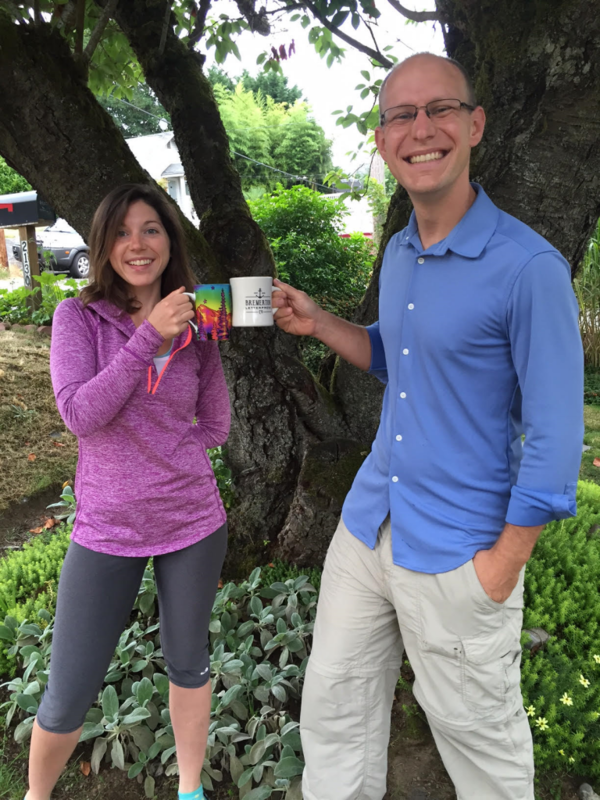 This week, Adventure-Some is in a different state for the first time since May! 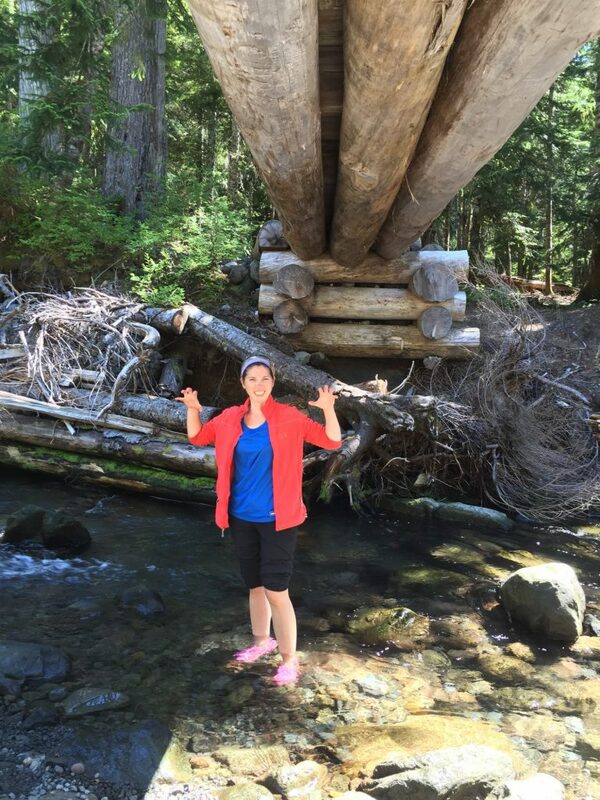 We’re currently exploring Glacier National Park in western Montana, with Jackie joining us. To make the trip easier we’ve actually left Lady Galapagos (our RV) back in Bremerton and are gallivanting about in the truck this week, which allows us to explore Glacier in more depth. Because our plan is to be out hiking just about every day this week, we assumed that internet connections would be few and far between, if available at all. As such, we actually wrote and scheduled this email a few days ago. (So we’re speaking to you from the past – Huzzah for time travel!) Fear not! The juicy details of the trip will be passed along in next week’s email. If you’re looking for more reading – check out the most recent post on Adventure-Some. Last week was low on adventure as we wrapped up projects at work and prepared for this excursion and our upcoming move. Thursday we drove out to the Hood Canal after dark and stood in the water, swishing it around to agitate the phytoplankton. Once disturbed, they lit up like tiny green sparks – it was like the stars in the sky were reflected as shooting stars in the water around us. Like we’ve said before, Washington is a pretty cool place. Friday we held a grilled pizza party for friends as a thank you for such an amazing time while in Bremerton (and to let them check out the RV if they hadn’t already seen it.) We are truly thankful and amazed by the friends we’ve made! We definitely are blessed. P.S. – Want to see pictures from our adventures? 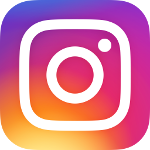 Check out the Adventure-Some instagram page for regular updates. In lieu of the previous post listing the things we love about our life on the road, we thought it only right to also share some of the frustrations we’ve encountered along the way.